When my 5 year old son is sleep-deprived and hungry, he turns into Wild Child. You know, like that case of the child that was raised by wolves in the 70’s? Only thing is, he was raised in a civilized home with all the teachings, love and amenities that any 5 year old would dream of. Getting punched enough times by your son while waiting for a train during morning rush hour that a Chicago Transit Authority officer actually intervenes is not how I wanted to start my week last week. Watching your definitely-too-old-to-crawl-child crawl on hands and knees through a group of gawking construction workers as I juggle my awkward laptop case, purse, lunch and hot coffee cup is kind of what nightmares are made of. Yet squatting obstinately in the middle of oncoming traffic are his normal responses to exhaustion. Thankfully, they are not mine. After a traumatic hour of walking alongside this mobile war zone, I finally got him across the threshold of school. And like magic, he’s happy. We manically hug, kiss and high five until the teacher practically peels him off my body. And I feel like I’ve been hit by a truck. I want to scream. I go home. I take a personal day. I cry. Because let’s face it, kindergarten is hard. And I never wanted to be the mom who couldn’t function because of the stress of momhood. But it was one of those days. 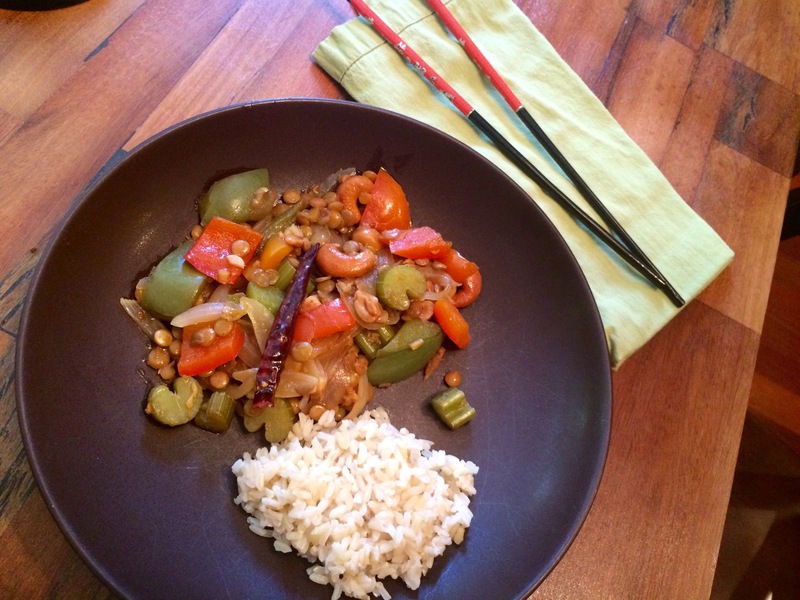 Luckily I had this week’s heart-warming Lentil Kung Pao from Vegan Richa to cheer me up. It’s sweet and sour, with a hearty bite of crunch that is kind of an outrageous way to enjoy my favorite legume! I think especially great about this recipe is how adaptable it is with other proteins and vegetables. I’m just going to go ahead and copy and paste the recipe because it’s perfect. Combine the lentils water and salt in a saucepan. Cover and bring to a boil over medium high heat, then reduce heat to medium and cook for 20 to 25 minutes. Drain excess water. Combine all the sauce ingredients in a medium bowl. Mix well to combine and set aside. Heat oil in a skillet over medium-high heat. When the oil is hot, add onion and chilies and cook for 3 minutes. Add the cashews and mix for a few seconds. Add garlic and ginger and mix in. Add the peppers and celery and mix well. Cook for 3 to 4 minutes. Add in sauce and cooked lentils and mix well. Reduce heat to low and cook for 3 to 4 minutes or until the sauce thickens and is absorbed by the lentils. Serve with cooked rice of choice. Yes it is! I love good food after a bad day.